Listening to Black Moon Mistress, it doesn't take long to understand why they've taken Erie's music scene by storm. Voted Best Up-and-Coming Band in this publication's very own Best of Erie awards, the same energy that the band's frontwoman Roxann Hudock exudes on stage comes through in our conversation about the band's up-and-coming plans, which includes having babies before returning with a full-length follow-up to last year's Shadow Reign EP. 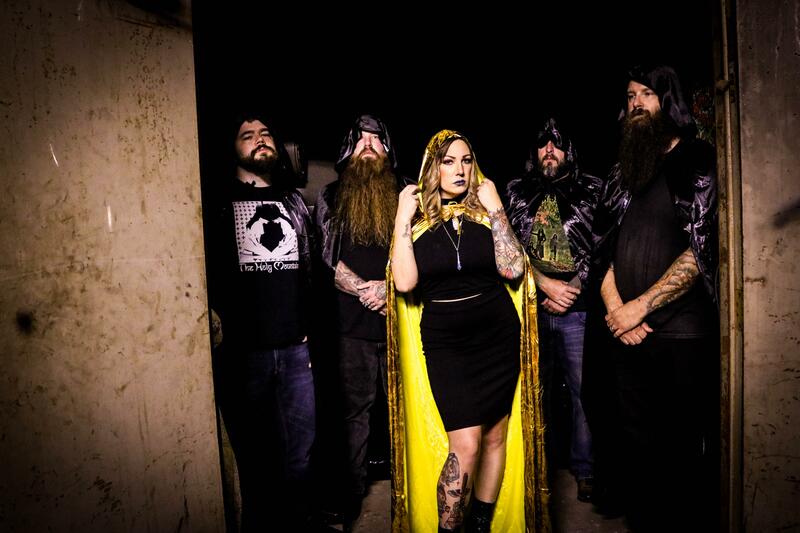 With their first singles available to stream and download, new music and shows on the way, and with the band on the cusp of greatness, there's never been a better time to get to know Black Moon Mistress and their unique hybrid of stoner metal and good old fashioned rock 'n' roll. Erie Reader: Congratulations on being named Best Up-and-Coming Band in our Best of Erie awards! How long have you been performing together? Tony Lusianno (guitarist): Black Moon Mistress has been a band since 2017, but besides Roxann, the rest of us have been in bands together for years. ER: Black Moon Mistress released a pair of studio singles last year. Do you have any plans for a follow-up release this year? TL: We just released the Shadow Reign EP last month. We are now writing new material for a full length release [tentatively] in the fall. ER: What is it like to write and perform music with your significant other? David Steele (bassist): I didn't know you knew Tony and I were married. Roxann Hudock (vocalist): [Laughs] But seriously, I enjoy creating music with Zach! Plus, it's a unique way for us to spend a little extra time together doing something we both love. ER: Your music has been described as stoner rock and doom metal as well as rock 'n' roll, plain and simple. What artists have inspired Black Moon Mistress' songwriting? TL: We all have various influences: Type O Negative for David, Black Mountain for me, Stevie Nicks and Grace Slick for Roxann, and Black Sabbath for Zach. ER: What does it mean to be a part of the Erie music scene to you? RH: There are a lot of great, diverse bands in this town. It's great to play shows with our friends in other local bands, and a bonus when we can play a show with someone different occasionally. ER: Do you have any favorite local artists? TL: Mala Sangre for David, This American Song for Roxann, Shattered Utopia for Zach, and I guess we have to mention Maniacal Device because we don't want to hear it from Morbid Rob. RH: The local music venue situation is somewhat disheartening. We are honored to have been able to play the Sherlock's stage through many incarnations of our musical ventures and as Black Moon Mistress. We also got to play a couple of shows at Bobby's Place before it met its demise as a venue. We've played some great shows at the Kings Rook Club, Basement Transmissions, and Scotty's, with many more to come. ER: Your current promo photo is unique. As a band, do you try to correspond your image with your music? TL: Roxann requires that we can't wear white t-shirts on stage. RH: [Laughs] Although I have said that in the past, in my brain it's all a cohesive image, the lyrics, the overall sound, how we perform, and the imagery. ER: What are Black Moon Mistress' goals for 2019? RH: To have babies and rock Northwest Pennsylvania. ER: If you could share a bill with any artist, living or dead, who would they be? Zach Hudock (drummer): Roky Erickson and Black Sabbath . DS: Crowbar and Fu Manchu. ER: Thank you so much for chatting with us. Is there anything you'd like to add? RH: Thanks to everyone who voted for us. Also, we'd like to give a shout-out to Matt Till, who recently left the band. Much love to our brother. We're taking some time off from shows to have the aforementioned babies, but we will be back in the summer to play shows with some new rockin' songs.